FleaClear has been launched in response to an increasing consumer demand for more affordable dog and cat flea solutions. Bob Martin FleaClear uses a molecule called Fipronil as its active ingredient, the same ingredient used in a number of Spot On products including Frontline. This was discovered in 1987 and has since been widely used to control pests and parasites. 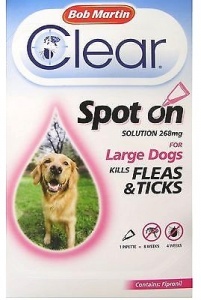 It has been shown to kill fleas and ticks quickly, to remain effective between treatments and even to be waterproof. Until recently, Fipronil-based products have only been available to pet owners from the vet. But after a detailed review by the Veterinary Medicines Directorate, Bob Martin has received approval to sell it over-the counter. This means that FleaClear is now widely available, and because it is from Bob Martin you know it will also be great value for money. For large dogs up to 40Kg. Contains 1 pipette for up to 8 weeks protection.